The Oakland Athletics head to Safeco Field on Sunday, September 3, 2017 to take on the Seattle Mariners. The expected starting pitchers are Daniel Gossett for the Athletics and Andrew Albers for the Mariners. The odds for this matchup have Oakland at +122 and Seattle at -132. The Athletics have a 71-59-4 over/under mark and a 69-65-0 run line record. The Mariners are 61-74-0 against the run line and have a 65-65-5 over/under record. The Athletics have a 58-76 overall record this season. Starting pitcher Daniel Gossett has a 3-7 record with an earned run average of 5.21 and a WHIP of 1.45. He has 50 strikeouts over his 65.2 innings pitched and he's given up 79 hits. He allows 10.8 hits per 9 innings and he has a FIP of 4.71. The bullpen has an earned run average of 4.62 and they have given up 428 base hits on the year. Teams are hitting .247 against the bullpen and they've struck out 436 hitters and walked 169 batters. As a team, Oakland allows 9.1 hits per nine innings while striking out 7.6 batters per nine innings. They are 24th in the league in team earned run average at 4.72. The Athletics pitchers collectively have given up 1,197 base hits and 620 earned runs. They have allowed 172 home runs this season, ranking them 12th in the league. Oakland as a pitching staff has walked 413 batters and struck out 1,003. They have walked 3.1 men per 9 innings while striking out 7.6 per 9. They have a team WHIP of 1.36 and their FIP as a unit is 4.50. As a team Oakland is hitting .243, good for 28th in the league. The Athletics hold a .427 team slugging percentage and an on-base percentage of .316, which is good for 23rd in baseball. They rank 28th in MLB with 8.2 hits per game. 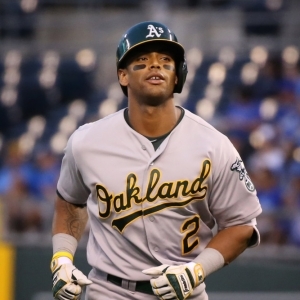 Khris Davis is hitting .233 with an on-base percentage of .324. He has 112 hits this season in 481 at bats with 91 runs batted in. He has a slugging percentage of .509 and an OPS+ of 122. Jed Lowrie is hitting .270 this year and he has an on-base percentage of .348. He has totaled 129 hits and he has driven in 50 men in 478 at bats. His OPS+ is 113 while his slugging percentage is at .439. The Athletics have 1,093 hits, including 250 doubles and 187 home runs. Oakland has walked 467 times so far this season and they have struck out 1,242 times as a unit. They have left 884 men on base and have a team OPS of .743. They score 4.4 runs per contest and have scored a total of 589 runs this year. Seattle has a 67-68 overall mark this year. With an earned run average of 4.20, Andrew Albers has a 2-1 record and a 1.80 WHIP. He has 11 strikeouts over the 15 innings he's pitched. He's also given up 23 hits. He allows 13.8 hits per nine innings and his FIP stands at 4.2. The bullpen has an earned run average of 3.94 and they have given up 431 base hits on the year. Teams are hitting .240 against the Mariners bullpen. Their relievers have struck out 442 batters and walked 178 opposing hitters. As a team, Seattle allows 8.8 hits per nine innings while striking out 7.7 batters per nine innings. They are 15th in the league in team earned run average at 4.49. The Mariners pitchers as a team have surrendered 1,180 base knocks and 601 earned runs this season. They have given up 204 home runs this year, which ranks 2nd in Major League Baseball. Seattle as a staff has walked 421 hitters and struck out 1,025 batters. They give up a walk 3.1 times per 9 innings while they strike out 7.7 per 9. Their team WHIP is 1.33 while their FIP as a staff is 4.80. As a team, they are batting .258, good for 13th in the league. The Mariners hold a .414 team slugging percentage and an on-base percentage of .325, which is good for 15th in baseball. They rank 13th in MLB with 8.8 hits per contest. Nelson Cruz comes into this matchup batting .285 with an OBP of .371. He has 130 hits this year along with 103 RBI in 456 AB's. He maintains a slugging percentage of .544 with an OPS+ of 144. Robinson Cano is hitting .271 this season and he has an OBP of .331. He has collected 131 hits in 484 at bats while driving in 78 runs. He has an OPS+ of 108 and a slugging percentage of .446. The Mariners as a unit have 1,190 base hits, including 240 doubles and 152 homers. Seattle has walked 406 times this year and they have struck out on 1,058 occasions. They have had 907 men left on base and have an OPS of .739. They have scored 4.61 runs per game and totaled 623 runs this season.